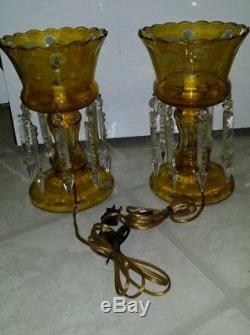 Large Pair Vintage Victorian Czech. 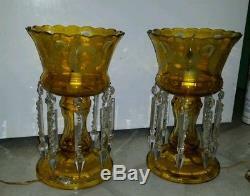 YELLOW Cut Glass Mantle Lustres. 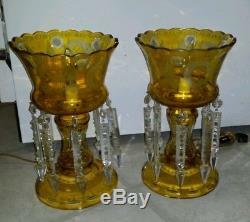 Description: Pair of yellow color crystal lusters with etched scenes, deer, bird, house and landscape decoration and has cut crystal prisms. Large Pair Vintage Victorian Czech Bohemian Yellow Cut Glass Mantle Lustres Stunning RARE pair, lovely etched designs of deer, trees, birds and home. No chips, cracks or damage. Crystals even look to be perfect yet for arguments sake I will call them having little chips even though I see and feel none. Each one has 8 dangles. Crystal dangles measure 6.5" overall and the long crystals alone are 5.5" long. They have be electrified, although by the looks of them, I think they will come out easily. They both retain their original labels. Great hard to find pieces to add to your collection. No chips, cracks, damage or repairs of any kind. This pair is just Fantastic! The item "Lg Pair 2 Vintage 12 Victorian Czech Bohemian Yellow Cut Glass Mantle Lustres" is in sale since Friday, November 17, 2017. This item is in the category "Pottery & Glass\Glass\Art Glass\Bohemian/Czech\Other Bohemian/Czech Art Glass". The seller is "vic-ts" and is located in cincy. This item can be shipped to United States, Canada, United Kingdom, Denmark, Romania, Slovakia, Bulgaria, Czech republic, Finland, Hungary, Latvia, Lithuania, Malta, Estonia, Australia, Greece, Portugal, Cyprus, Slovenia, Japan, China, Sweden, South Korea, Indonesia, Taiwan, South africa, Thailand, Belgium, France, Hong Kong, Ireland, Netherlands, Poland, Spain, Italy, Germany, Austria, Russian federation, Israel, Mexico, New Zealand, Singapore, Switzerland, Norway, Saudi arabia, Ukraine, United arab emirates, Qatar, Kuwait, Bahrain, Croatia, Malaysia, Brazil, Chile, Colombia, Costa rica, Panama, Trinidad and tobago, Guatemala, Honduras, Jamaica, Barbados, Bangladesh, Bermuda, Brunei darussalam, Bolivia, Ecuador, Egypt, French guiana, Guernsey, Gibraltar, Guadeloupe, Iceland, Jersey, Jordan, Cambodia, Cayman islands, Liechtenstein, Sri lanka, Luxembourg, Monaco, Macao, Martinique, Maldives, Nicaragua, Oman, Peru, Pakistan, Paraguay, Reunion.